A bodybuilder's most important muscle is his heart, and greatness comes from within. Branch Warren knows this better than anyone. He works, trains, and lives like a champion. "You want to be big? Lift big weights. You want to be little? Lift little weights." Branch Warren is big. Branch Warren lifts big weights. Meet the 2011 Arnold Classic champion: he&apos;s big, he&apos;s bad and he&apos;s ready to reclaim his throne. He hit a speed bump or two since last March, including a serious injury, but from the looks of things, he&apos;s ready to roll. So look out Columbus. Rolling thunder is headed your way. 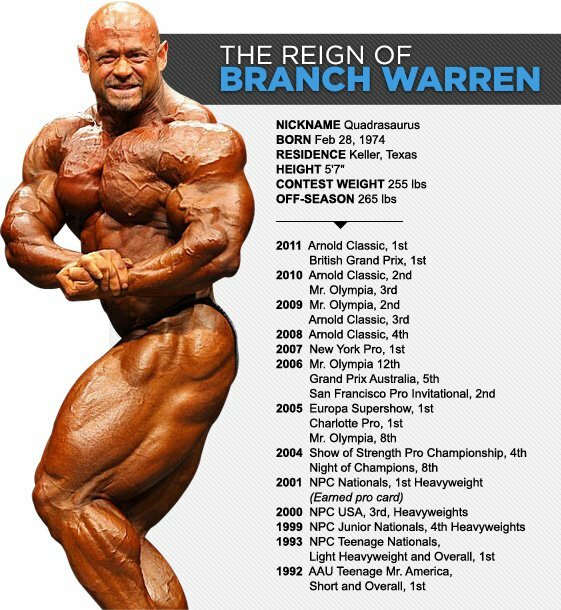 Branch Warren doesn&apos;t say much; he usually lets his physique and his many trophies do the talking. But for Bodybuilding.com, Warren opened his home and his gym. Get a glimpse into the life of one of the baddest men to ever pick up a barbell. Branch speaks softly but carries massive weight. Respect. These videos speak for themselves. Meet the Branch you don&apos;t see in the gym: the guy who loves his family, plays with his dogs and knows what it means to overcome adversity with class. Bad@ss Branch Warren shares his shoulder workout as he prepares to defend his title at the 2012 Arnold Classic.